Why choose natural skincare for children? Whether you are a first-time parent or a seasoned one, choice of childcare products have always been a paralyzing paradox. Whether it is skin care, bath time or bedtime regimes, product selection places a lot of responsibility on the caretaker. When it comes to choosing products to put on your little one's skin, the choice becomes even harder. A baby's skin is thinner, delicate and more permeable than an adult. It hence becomes essential that when you walk down that baby care products aisle, select the right products for your baby. If it gets too overwhelming, remember that – whenever in doubt – try the natural one. Most products in the market seem pharmaceutical and smell like a mix of chemicals. Some of these could do more harm than any good to your baby's skin in the long term. It’s time to avoid the pharmaceutical and think of what nature has to offer. Of all the skin care products, (even the natural ones), rose petals have been proven to be more effective and safe – especially if you are trying out something new for your infant. Most of the rose water products available today are made from clear water and pure rose petals. The process used to prepare rose water is by steam distillation. It retains most of the healing and therapeutic value of the ingredients. Purvari specializes in luxurious plant-based products that care for the blooming health of your skin. Carefully blending pristine floral waters, undiluted herbal extracts, and soothing natural minerals, Purvari gathers the best of what nature has to offer to give your baby’s skin, the gentle care and nourishment it deserves. Most of the natural skin care products offer chemical-free nourishment to the skin. They are perfect for the delicate infant skin that does not need to be exposed to harsh chemical-based products. Rose water contains mild, natural ingredients and no irritating synthetic chemicals and has a natural healing effect on the infant skin. When you are overwhelmed with options while choosing skin care products for your baby, it’s always safer to select something that’s pure, gentle and closer to nature. Is it time to re-think your skincare? Skincare does not need to be complicated. It is more about understanding and empathizing with what your skin wants. Just like our body absorbs the food and nutrients we put in, our skin too absorbs almost 64% of what we apply on it. That's why it is essential to be mindful of what you are putting on your skin. So, think about what you applied to your skin this morning – and yesterday – and the day before that? Is it time to re-think your skin care options? Is it time to put your skin on an organic, natural and nutritious skincare ‘diet' and prevent it from absorbing toxins and other unnecessary chemicals? Usually, our skincare cosmetics are an extensive collection of masks, creams, moisturizers and lots more. Many of these products are more pharmaceutical than natural and contain chemical compositions that strip your skin of their natural oil. Further, some of the ingredients may cause skin irritation too, particularly for those with sensitive skin. Choosing skin care products deserves careful consideration. So, is it time to re-think your skin care options? Let's begin with giving your skin a break! A break from the evils of reactions, irritations, and rashes. This time, indulge in all-natural skincare. When it comes to all natural skin care, rose petals have been proven to be skin-friendly with rich benefits and naturally healing capabilities. 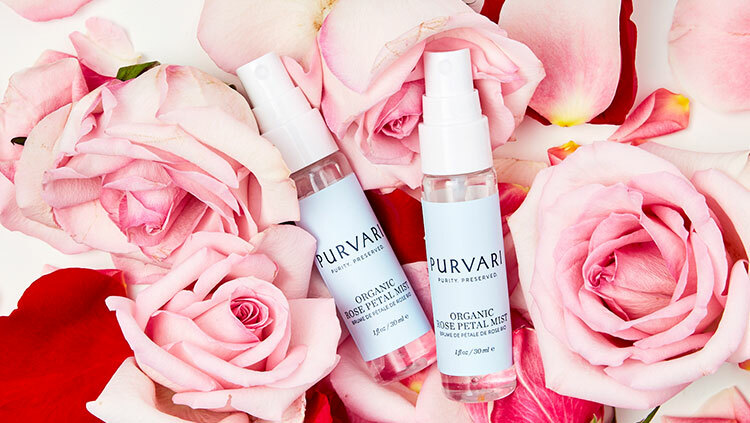 We at Purvari are passionate about using the wisdom of nature and its healing abilities to empathize and understand exactly what our skin needs. Among everything that’s natural, rosewater is known to have natural nutrients that are ‘kind' to your skin. It is more therapeutic and non-pharmaceutical - that’s what makes it a perfect choice for your daily skincare. 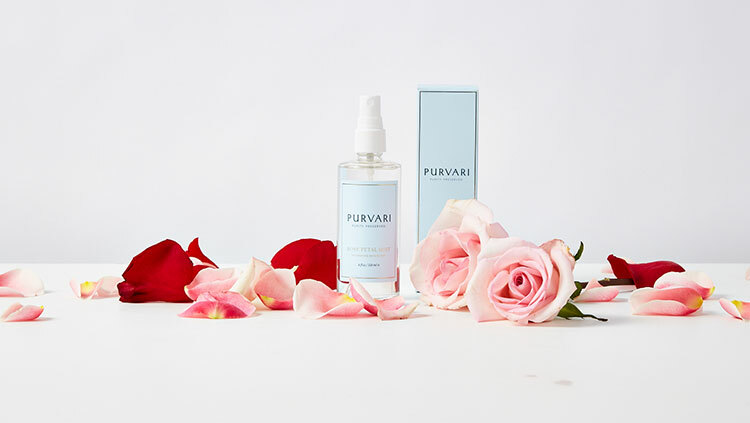 Purvari’s Rose Petal Mist is designed to nurture your skin and complexion with wholesome, chemical-free nourishment that's as pristine and natural as the skin itself. It is rich in natural water-soluble nutrients that can only be extracted from petals through steam distillation or steeping. Roses are known to be a natural source of vitamin C, geraniol and quercetin – antioxidants that exhibit mild anti-inflammatory, soothing, and brightening properties. The benefits of everything ‘organic' and ‘natural' have been known for a thousand years – and now it's time to re-think our options, going back to the roots of what nature has to offer and make a mindful decision about our skincare.